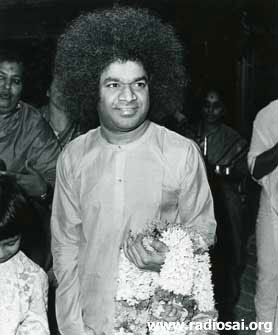 Every year during the Dasara celebrations Puttaparthi is witness to a grand spectacle “The Veda Purusha Sapthaha Gyana Yagna” – a Vedic sacrifice performed in the divine presence of Bhagawan Baba for seven days. This festival in Puttaparthi is more than six decades old. With time, celebrations and events see a lot of change but certain things remain the same just like the powerful and sublime nature of this sacred sacrifice. But yes, five decades ago it had a totally different charm and it is a very rewarding experience revisiting those golden moments when Baba’s physical body was in its 40s. So here we have a journey into the precious past, a riveting description of Dasara in Puttaparthi in the words of Prof. Kasturi in the year 1962. It was an unforgettable scene: the sweet melody of Nadaswaram filling the air; the fragrance of flowers, incense, and sandalwood wafting about; the cow with its charming little calf proud of the necklaces, bangles and jingles it wore strutting in front; women waving arati and holding up plates of fruits on either side; Baba in His resplendent robe emerging from the Prashanti Nilayam mandir with Sri Boorgala Ramakrishna Rao and Brahmasri Kameswara Ghanapad on either side, behind Him a bevy of a hundred ritwiks, pundits and scholars from all parts of India, decked in multicolored silk (each according to the function allotted to him in the Yagna: white for those reciting the Vedas, red for those partaking in the Rudrahoma, yellow for the others); thousands of bhaktas, their faces bright with joy born of the recognition of the uniqueness of the day – the day when the Avatar of the Lord was assuming the guardianship of the Veda-Bhaktas from Kerala to Kashmir, men, women and children (children born in the Sai Era, blessed to spend their entire lives in the sunshine of His Grace) – this stream of joy moving in serene sublimity to the Yagasala; the charming Mantapa erected with intense devotion by hands, which though new to the task, were charged with skill and artistry by Bhagavan Himself. The intonation of the Vedic mantras by the entire group in ecstatic harmony thrilled every heart, for the sacred vibration was suffused with the glory of God. The Yagna began at 9:30 a.m. on the first day of October 1962. The gods were invoked and installed and worshipped as the Vedas dictated. Athi Rudrahoma was done, the Bhagavatham and the Ramayana and the Devi Bhagavantham were read, the Sankarabhashyas were repeated, Suryanamaskaram with the appropriate Vedic chants was performed, the Saligrama and the Sahasialinga were ritually worshipped, the Yajurveda, in its two rescensions were recited, and the Samaveda and the Atharva Veda were chanted. The huge gathering of bhaktas sat stilled with awe and admiration and filled their hearts with the perfume of the Sanatana mantra. Bhagavan was present in the Yagasala every day sitting in the midst of the Vedic pundits or moving among the bhaktas. The hills around the Nilayam which had the privilege of echoing the mantras will long remember the heavenly harmony of the mantra which woke the sleeping rocks. Yes, many a stone awoke to that age-old voice and melted at its magnificent message of hope. Baba said to the assembly of ritwiks pundits and bhaktas: "I am not the person who is doing this Yagna: I am the Person who is accepting it." Ruminate for a moment on that declaration and then you will realize the atmosphere of Devaloka, of Vaikuntha itself (as some of the eminent Vedic pundits announced) that pervaded the Yagashala. And the Jnana Yagna. Every evening for eight days, from 3:30 to 8:00 p.m., the galaxy of pundits, from Secunderabd, Warangal, Guntur, Rajahmundry, Amalapuram, Pithapuram, etc., pundits famed as specialists in scriptural lore and as popular exponents of the Vedic message, gave the gathering the substance of their long and arduous studies. And the President Brahmasri Uppaluri Ganapathi Sastri, the undisputed Master of Vedic Scholarship, in his own effortless analytical disquisition of Vedic mantras explained the Vedic conception of Yagna with all its attendant rituals and the Vedic conception of Divinity which described Baba Himself, as he realized and revealed more and more clearly as the Yagna proceeded. 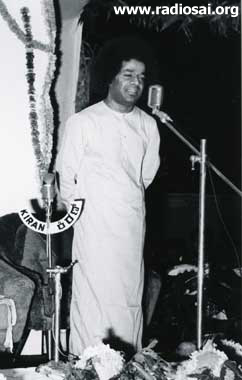 Baba spoke at the end of every series of speeches, summing up the scholarly expositions in parables and stories, revealing new facets of Dharma or lifting the veil of Maya for a moment from His Own Mystery. He assured the Vedic Pundits that He was on the task of Dharmasthapana (establishing righteousness) for which He had assumed human form; that they need no longer pine in neglect and dishonor, that He will provide them shade and shelter and reestablish in the world the real value of Vedic religion. A program of prayer and Jnana offerings was arranged spontaneously by the pundits, with Baba seated on an effulgent Seshathalpa, named by them, "Tribhuvana-vijaya." 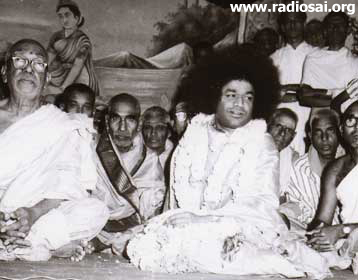 It was a reminder of the Vijaya Yatra which Baba has entered upon in answer to the prayers of good men. Baba has often said that He could be understood only by those who have studied the Sastras. Bhaktas, ritwiks and pundits saw the truth of that declaration demonstrated before them. He called, they came; they saw, they recognized; they merged in the sea of bhakti (devotion). 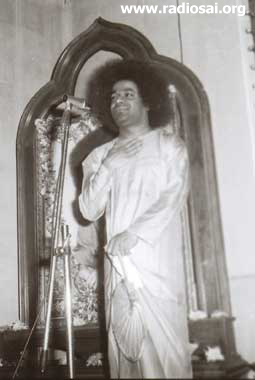 Every evening during the Saptha (week), the pundits and scholars who came for the Vedapurusha Jnana Yagna gave erudite discourses and Baba elucidated the points raised by them from the Vedas, Vedanta and Sastras. “The ghee and the sandalwood are but symbols for other more valuable offerings, which these critics ignore. The cow or “go” means the Jivi and since the ghee is the most precious product of the cow, the idea symbolized by the offering of ghee is that man must offer his most precious treasure, the inner core of his entire personality, to the gods. The Adhitya (sun) is the presiding deity of the eye and the Adhityayajna seeks to teach the need for all eyes to cooperate in developing a united vision. “Everyone is aware of the principles of the Dharma yet they walk in the path of Adharma. That is the tragedy. Hunger is appeased by food; so too all grief is assuaged by Dharma. Birth is for giving Dharma a chance. Good deeds are Dharma, bad deeds are Adharma. So long as there is breath in the body, Dharma must be adhered to. “Nowadays, the thorn bush of Atheism has spread and it threatens to destroy the valuable crop of faith in God. To counteract this, the Asthikas, the Sadhakas, those who follow the Vedic path and study the Vedas and Sastras have to be tended with loving care and honored for their genuine greatness. You must have seen some feasts, where the men who serve, simply pass along the line shouting, “Laddu! Laddu!” carrying a basket-load of laddus on their shoulders.